A few weeks ago I was working on a special project (more on this later!) and really wanted to make a floral crown headband. I wanted it to be really delicate and thought that I would make some tiny flowers instead of buying the fake kind. 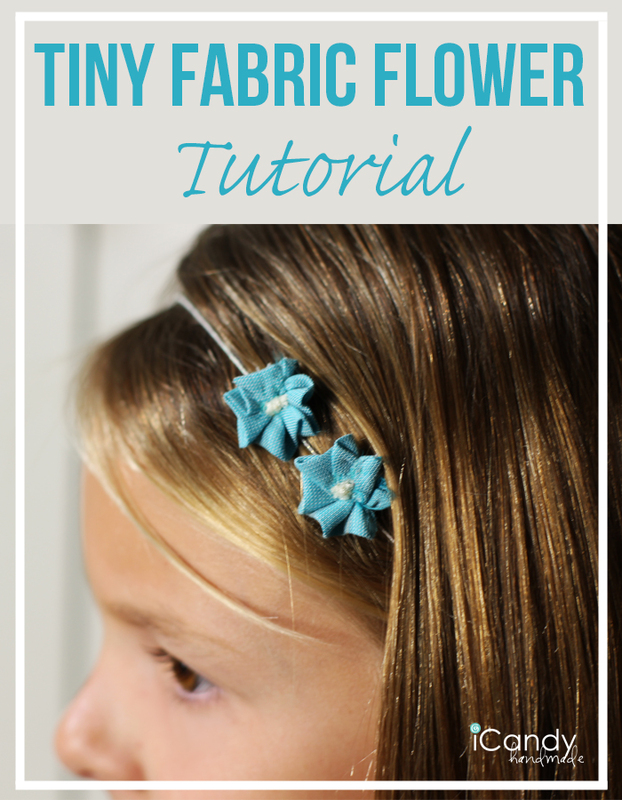 I looked up fabric flower tutorials, but nothing was quite what I was looking for. I wanted them tiny. So I started working with some scrap fabric to see if I could come up with something. After twisting and folding for a few minutes, I was on to something. It was a bit trial and error, but I got it to work. 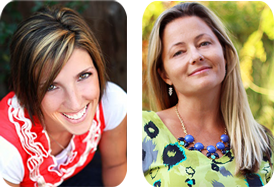 And now I love them and want to make lots more… Perfect for girls/babies of any age. 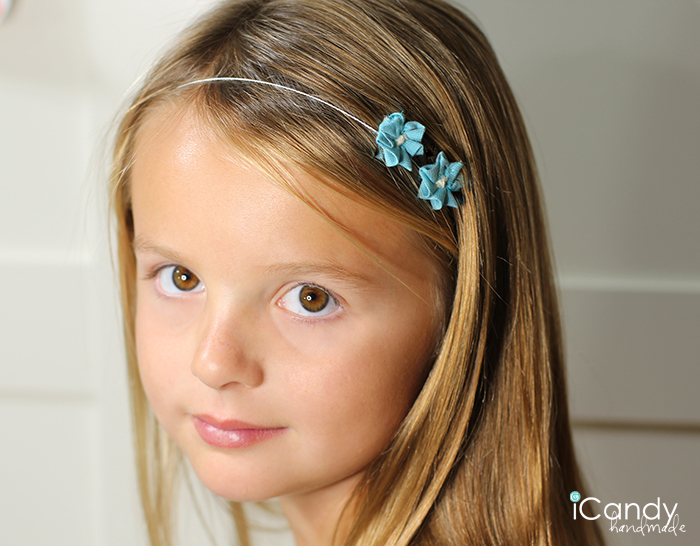 They can be put on clips, bobby pins, thin elastic cording (shown) or even metallic wire for a crown. 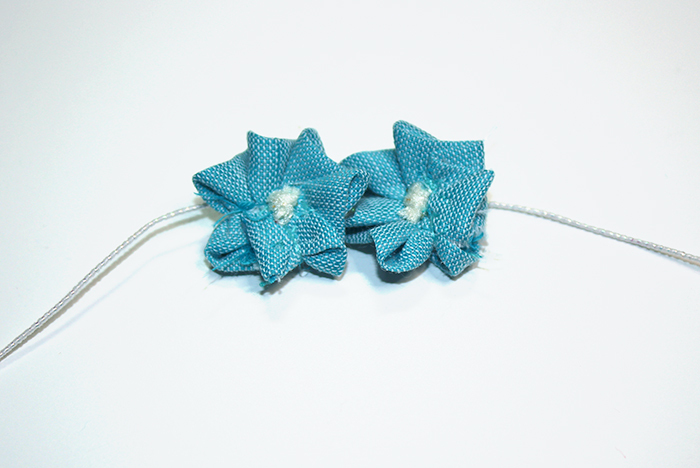 The flowers shown here are made with a solid cotton, but they also look amazing out of a print or even out of tulle. 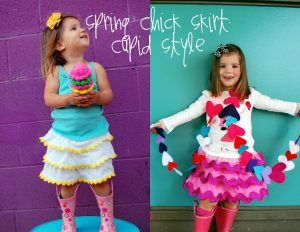 Almost any fabric type would work. Fold the rectangle in half horizontally. Finger-press. Thread your needle and knot one end. With the fold side up, fold back the bottom corner of one side of the strip. Fold up both layers. Fold the point down to meet the bottom edge and form a little triangle. Fold the triangle so the point faces inward. Starting from the back side, pull the needle and thread through, a few times, until secure. 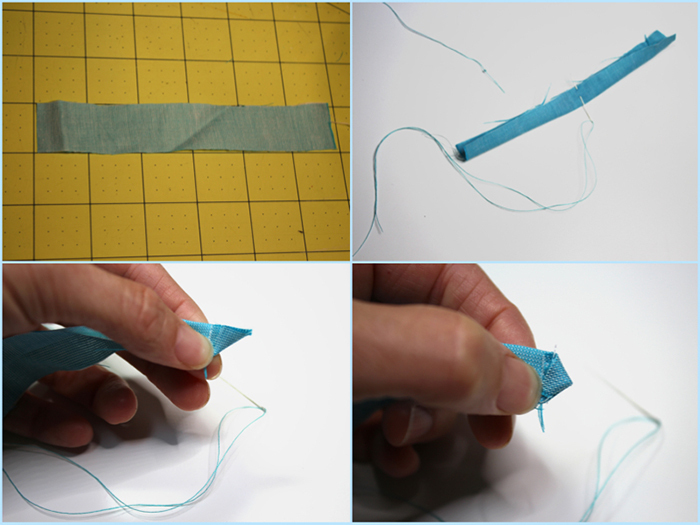 Holding the triangle, take the strip of fabric and fold it as shown- a little pleat behind the triangle. Stitch through all layers a few times to secure. If any raw edges show at the bottom (like you see in the 4th picture behind the triangle) stitch it so it doesn’t show from the front. 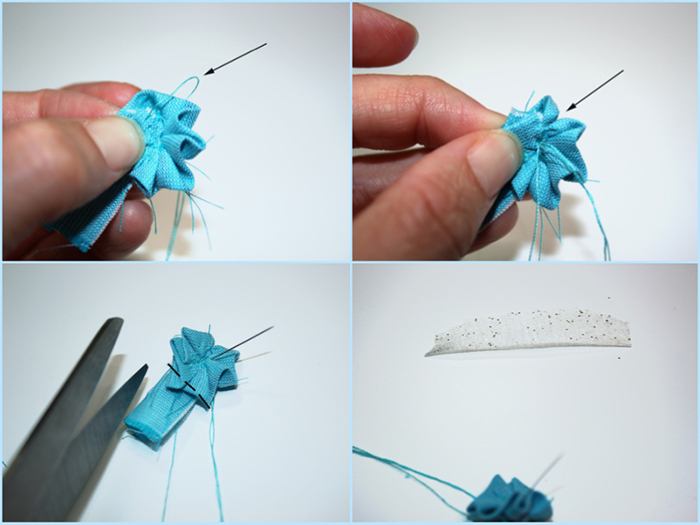 Turning the flower as you go, repeat with the folds as shown. 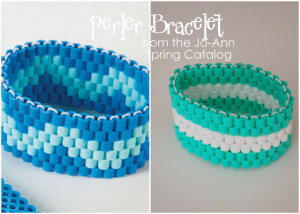 Each time you make a pleat behind the last one, stitch thoroughly through all layers. When you get back to the triangle, make a sort of box pleat, and fold the edge of the strip down. 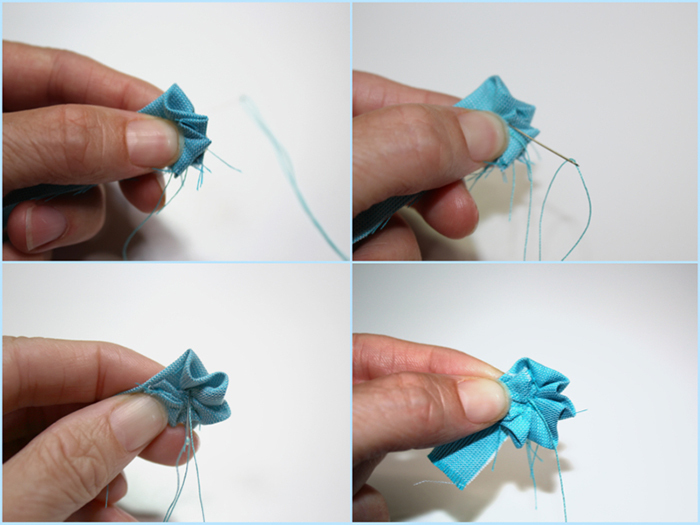 Holding the flower securely, stitch up and around your box pleat a couple of times. Pull tight, so it makes two petal shapes. 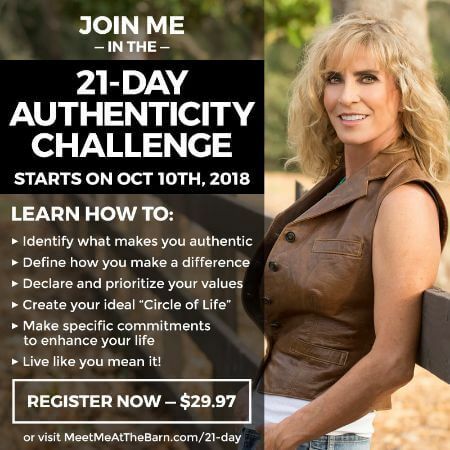 Stitch through all layers securely. Trim the excess fabric off behind the flower as shown. Cut a tiny (2″ x 1/2″) strip of contrasting fabric. I used tulle, but any thin fabric will do. 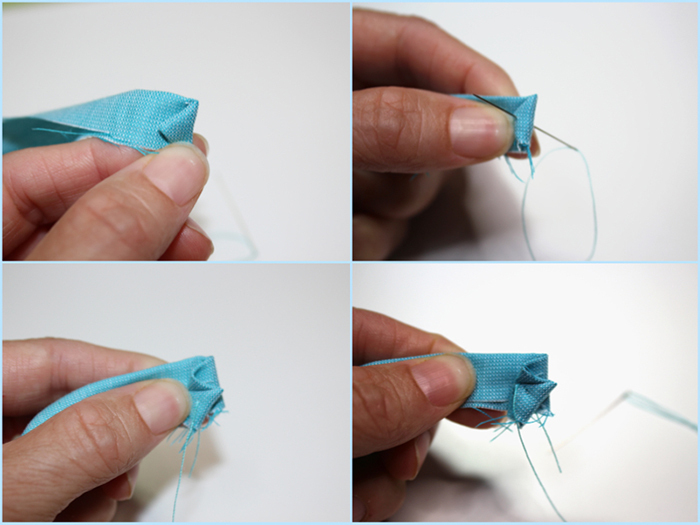 Tie a tight knot in the fabric and trim the excess fabric close to knot. 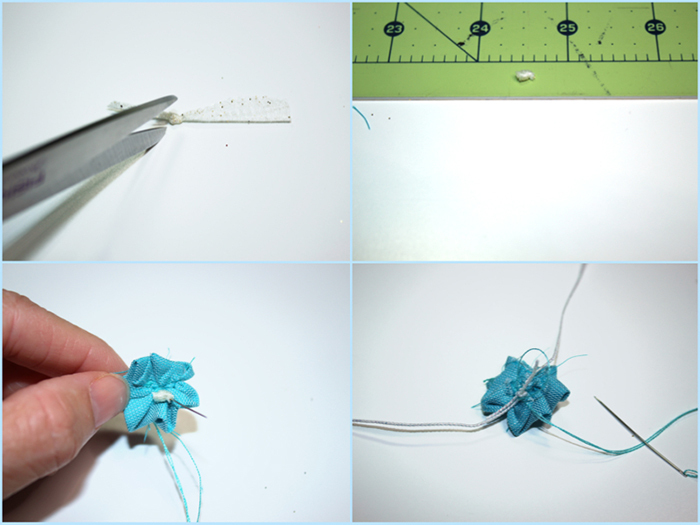 Make sure your needle is coming through from the back and stitch the knot on the center of the flower. Stitch in about 4 places, pulling tightly. If you do tiny stitches, you won’t see the thread at all. 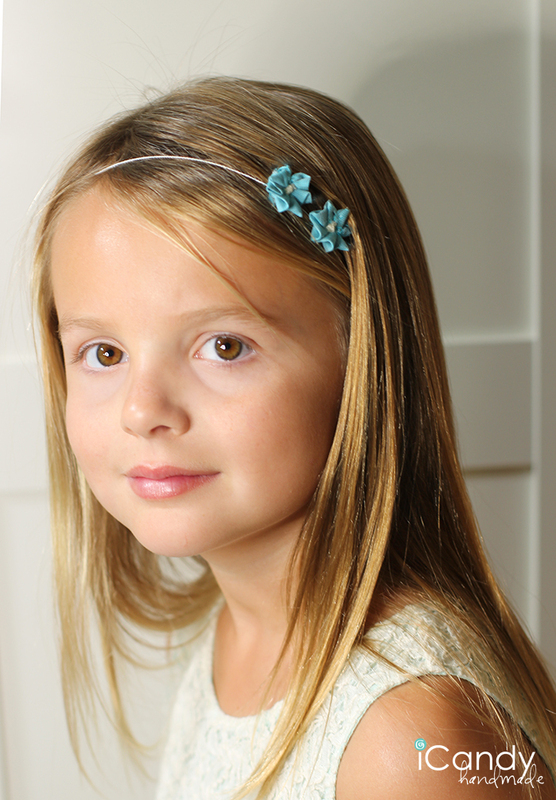 If you are making a headband or crown, stitch around and around the elastic cording in about 4-5 spots. Pull tightly. Make sure you cover the knot of the cord. Don’t pull the thread to the front side of the flower.